↑ Metzger, Bruce Manning; Coogan, Michael D (2004). The Oxford Guide To People And Places Of The Bible. Oxford University Press. p. 28. ISBN 978-0-19-517610-0. สืบค้นเมื่อ 22 December 2012. ↑ Levenson, Jon D. (2004). "Genesis: Introduction and Annotations". In Berlin, Adele; Brettler, Marc Zvi. The Jewish Study Bible. Oxford University Press. p. 29. ISBN 9780195297515. ↑ Graves, Robert; Patai, Raphael (1986). Hebrew Myths: The Book of Genesis. Random House. p. 315. ISBN 9780795337154. ↑ Schwartz, Howard; Loebel-Fried, Caren; Ginsburg, Elliot K. (2007). Tree of Souls: The Mythology of Judaism. Oxford University Press. p. 704. ISBN 9780195358704. ↑ Day, John (24 April 2014). 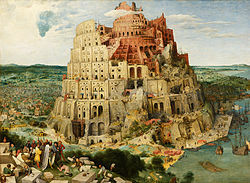 From Creation to Babel: Studies in Genesis 1-11. Bloomsbury Publishing. pp. 179–180. ISBN 978-0-567-37030-3. ↑ John L. Mckenzie (October 1995). The Dictionary Of The Bible. Simon and Schuster. p. 73. ISBN 978-0-684-81913-6. หน้านี้แก้ไขล่าสุดเมื่อวันที่ 15 มกราคม 2562 เวลา 22:10 น.